The language of following instructions can be very confusing for young children. As Elizabeth explained in this post, when you give an instruction, very often a child does not actually need to understand all the words to follow it. In fact, sometimes they don’t really need to understand the words at all – they can understand from the context. For example, if we are standing by the door and I’m holding the child’s coat, they don’t really need to understand the words “put your coat on”. They can just pick up what I want from the situation. 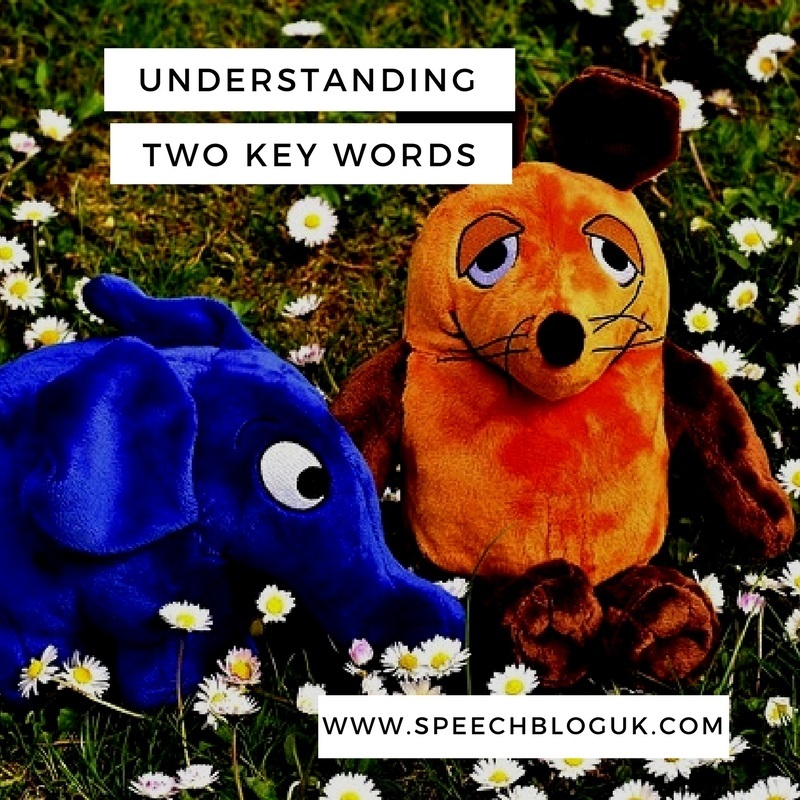 As speech therapists, we often talk about how many key words (or information carrying words) a child can understand. This refers to how many words they have to understand in an instruction in order to follow it correctly. The basic rule of thumb is that for each key word, there needs to be a choice. For example, if I say “give me the ball” and there is only a ball out, the child does not need to understand the word ball. However, if there is a ball and a teddy on the table and I say “give me the ball”, now they have to understand one key word “ball” so that they pick up the correct object. Elizabeth wrote about helping a child to understand one key word. This post also covers some of the underlying skills as well. Please read this post first. However, once your child can follow instructions with one key word, you can move on to instructions with two key words. Here are some ideas of activities to try. Put the two soft toys next to each other and the food items spread out in front of them. Sit opposite your child, at their level. Get their attention by making eye contact and/or saying their name if you need to. Say “teddy and dog are having a picnic. Can you help them find some food?” Here are some instructions you can give. I have put the key words in bold in each example. Say “give the apple to the dog“. Make sure you don’t look at the items or point to them to give the answer away. If your child is able to do this, praise them, and then pretend to make the toy eat the food item. Then put it back where it was to begin with so that you can use it as a choice for the next instruction. Here are some more instructions you can give. Give the cake to the teddy. Give the banana to the teddy. Give the cake to the dog. Give the apple to the teddy. Give the banana to the dog. Once your child gets good at this, you can add another soft toy, and/or more food items and then you have a wider range of instructions you can give as well. A room with several distinct locations – in my example I have chosen window, door and table. Again, you can make this harder or more interesting by changing the actions (you could try crawl or skip for example) or doing it in a different place. For example, why not go outside and use a tree, a bench and a fence? Do make sure your child understands the individual words first though and only use words that you are sure they know. Some children find verbs a lot more difficult than nouns so they may find this activity harder than the others. If you need to work specifically on verbs with your child, you can find more information here. Put the sheep in the field. Put the sheep in the barn. Put the pig in the barn. Put the pig in the field. Again, make sure you put the items back each time, so that all of the choices are available to the child with each instruction. This is what makes it a two key word activity. There are other similar activities you can do too, but these give you a few ideas to get you started. Using real objects is by far the best way to start when working on key words. However, once your child is getting the idea of this well, there are a couple of nice apps for working on key words that you could use from time to time to vary the practise a little. My favourite is Key Word Kids, but you can also use Splingo’s Language Universe too. What are your favourite activities for working on two key words? Watch out for a post on three key words in a few weeks’ time too.